A drop-dead gorgeous racer-style BMW R100R from XTR Pepo, a new motorcycle manufacturer based in New York City, and a rare Diamond Atelier build up for sale. The top end of the market has been busy this week. Suzuki DR650 by Diamond Atelier This stretched and slammed Suzuki DR650 should look a little familiar to you. We featured the bike when Diamond Atelier originally released it late last year, and after time on the road as a showcase for Tom and his Munich-based crew, it’s now up for sale. But rather than send it off as-is, the DA boys decided a few touch ups were in order. BMW R100R by XTR Pepo Around the EXIF office, we’re trying to figure out whether the paint had actually dried on Pepo Rosell’s Ducati Monster before this BMW R100R went up on the bench. 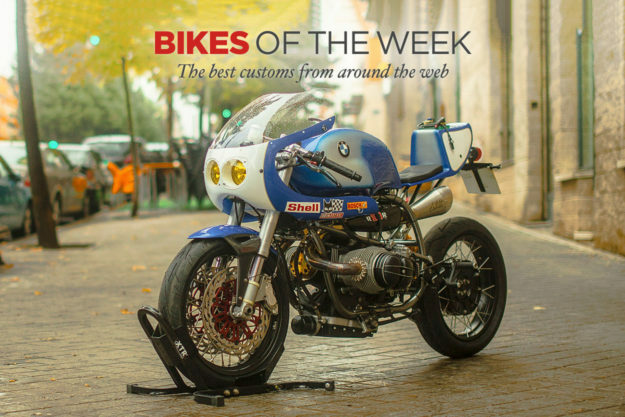 Dubbed ‘Don Luis,’ the Beemer was built as a tribute to the owner’s recently deceased father. The endurance racer vibe is more than skin-deep: Tipping the scales at a scant 165kg and running with a 24-litre tank swiped from a Guzzi, this R100R should run with the best of them, long into the night. 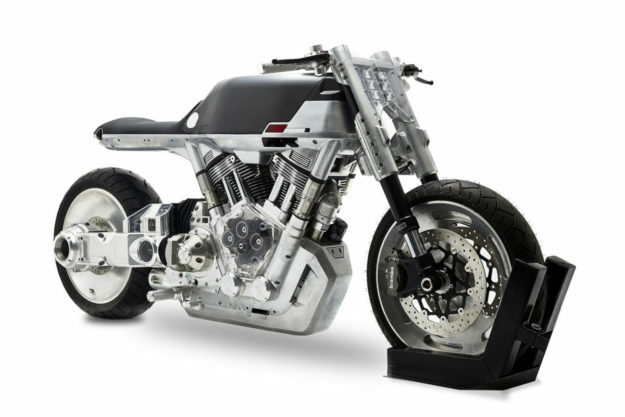 Vanguard Roadster Designed and built in The Big Apple, the Vanguard is a limited release motorcycle that debuted at NYC’s International Motorcycle Show this weekend. Built around the tire smoking 1917cc S&S X-Wedge powerplant found in Arch and Confederate rides, it’s about as subtle as a meticulously milled sledgehammer. Honda CB750 by KickMoto When Jeff Shaw and Jordan Braun of KickMoto were handed the keys to a 1972 CB750K, the instructions were simple: Make it clean, and make it black. 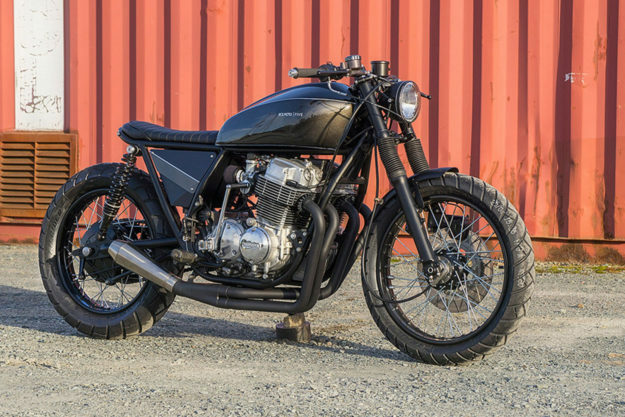 ‘Bad Apple’ is the fifth build to roll out of KickMoto’s Nova Scotia garage, and it is most definitely black and undeniably clean. 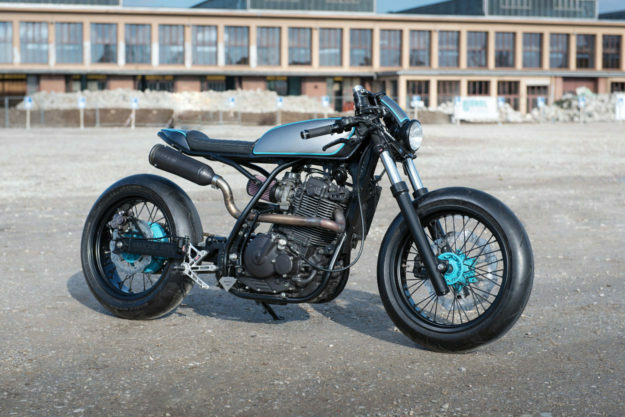 Built with a brat-tracker vibe, it features a larger, later model CB750 tank, and its mags have been swapped for laced units—built from a motley collection of hoops and hubs. 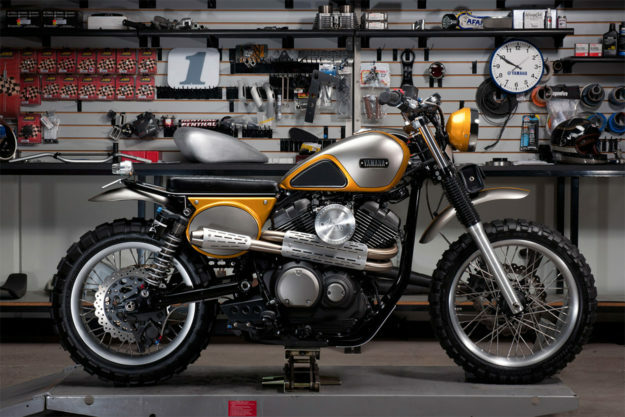 Yamaha SCR950 by Jeff Palhegyi When we were invited to check out Yamaha’s new scrambler, we were a little skeptical of its moniker. After a day aboard the altered Bolt, it won us over with its character and rideability. But was it a true scrambler? SoCal-based Jeff Palhegyi must have felt the same way, because visually, his Yard Built SCR950 talks a much dirtier talk. Built in homage to Yamaha’s Big Bear Scrambler, Jeff’s version better showcases the SCR’s shortened swingarm and revised subframe. The move to a beefier set of two-into-two, mid-mounted cans certainly helps a bunch, too. BMW K1100 LT by De Angelis Elaborazioni When it comes to BMW’s K-Series, builds are either Flying Bricks or bricks that truly fly. 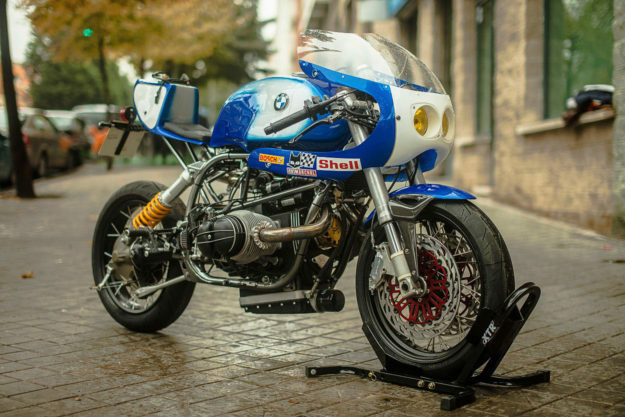 This race-ready K1100 LT from Italy’s De Angelis Elaborazioni falls into the latter category. 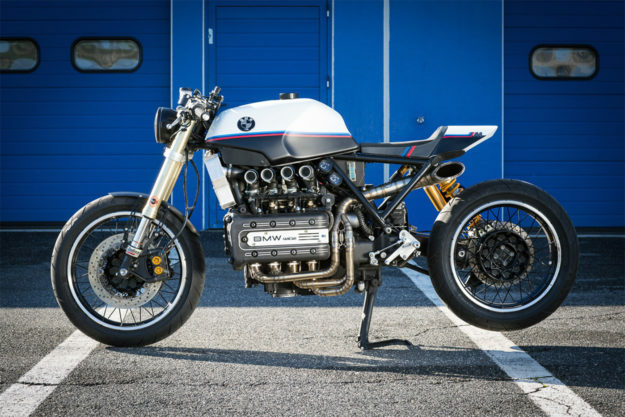 As if the M-inspired colorway cloaking this K’s custom bodywork weren’t enough, builder Giorgio has added a race spec EPROM ECU unit and a glorious slash-cut exhaust to help earn the M badging. A track ready radiator from Italy’s RcRaditors was fitted to help with cooling, and the forks were swapped for a 50mm USD setup topped with a pair of Robby Moto clip-ons. A newer GS was robbed of its rims to allow for the laced look without having to worry about tubes; the rear is mounted smartly to the single-sided swingarm to better show off the subframe work and all-aluminum tail. Giorgio definitely knows his way around a K, and this is his finest yet.